Welcome to you home in the country. 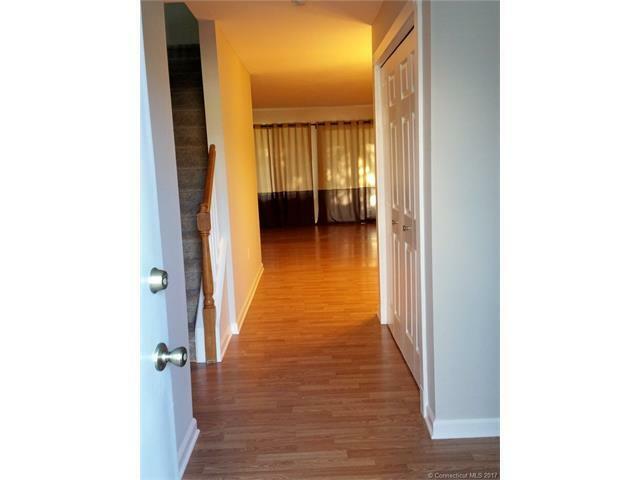 This is a 2 bedroom townhouse condo has been remodeled/upgraded and is ready to be moved in to for the holidays. This corner end unit has a patio overlooking a backyard area which is perfect for outdoor entertainment, yard games or relaxation. Freshly painted through out. New laminate flooring in the dining room/living room areas. Kitchen also has new flooring and stainless steel appliances. Lovely breakfast nook too. Wainscoting in both bathrooms, even the molding around all doors and windows have a unique flare. New carpet in both bedrooms. Master bedroom has a huge walk-in closet (5'0" x 4'6"), and balcony with a view of the yard. In addition, there is approx. 500 finished sf in the lower level, with a laundry room. No need to worry about electric heat added storm windows and doors. ADT system is in place, just needs to be activated. Conveniently located to Cromwell Hills' amenities and is a short walk to the Clubhouse, two tennis courts and pool. Nearby are supermarkets, restaurants, and I-91 & Route 9 for commuting to Hartford, New Haven, and the Connecticut shore. This is a terrific opportunity to live at Cromwell Hills and enjoy the 1,865 sf of finished living space.